Since about mid-day 9/24 mail.twc.com SMTP on port 587 returns a 421 response upon connection. My understanding is 421 means the SMTP server is unable to function. 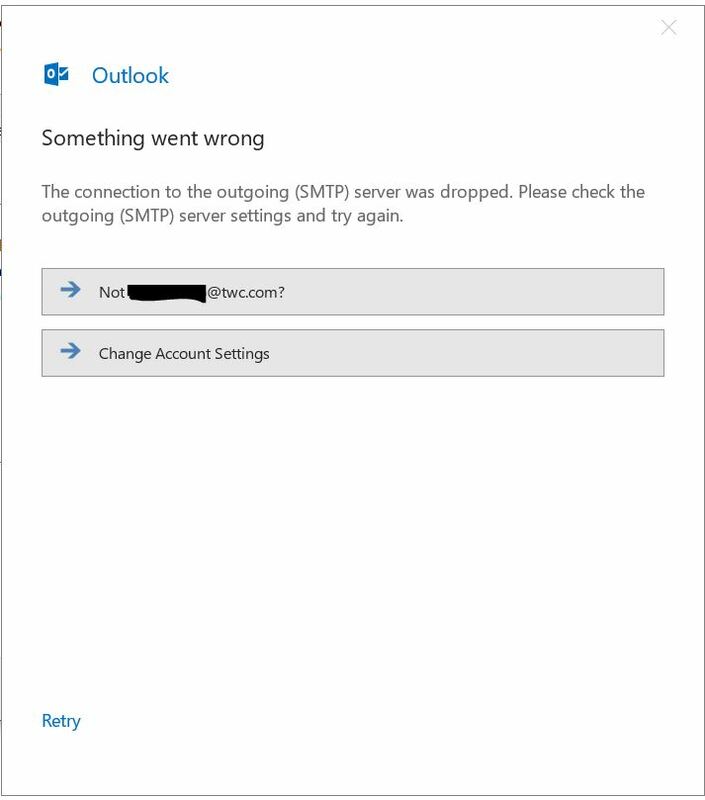 I am unable to send any email via the mail.twc.com SMTP server. "SMTPC" 6916 43177 "2018-09-25 08:23:30.384" "107.14.73.68" "RECEIVED: 220 Welcome to Road Runner. WARNING: *** FOR AUTHORIZED USE ONLY! ***"
"SMTPC" 6916 43177 "2018-09-25 08:23:30.384" "107.14.73.68" "SENT: EHLO ******. ***"
"SMTPC" 6724 43177 "2018-09-25 08:23:32.424" "107.14.73.68" "RECEIVED: 421 Service not available, closing transmission channel"
Please advise as to when the email server will be fixed. There is currently not a reported known issue with the email server. 421 errors tend to be generic errors and can be caused by varied issues including slow connections, attachments that exceed limits, file corruption or viruses. This error is occuring. I have been suffering as well since 9/24 3:08PM EST. This is from the Cleveland area, and the same response is received from all rr.com smtp servers too. If it's helpful, I'm in the Los Angeles area. The image indicates an issue with Outlook. Are you able to send messages through the webmail site mail.twc.com? I've tried hMailServer, Outlook and telnet (mail.twc.com port 587) all with the same results. Using the website isn't a problem. It's using a client with this as the SMTP. The web client is able to send.